There's something funny going on with Carol Stanley's trust fund. Mr. Dawson is concerned; as is Carol's quasi-guardian, the inestimable Abigail E. Leeds. Perry gets $2,000 in cash and one half of a $10,000 bill as a retainer in case his services are needed to defend a mysterious, veiled woman. Then, in one of the most macabre scenes ever on the show, he finds a wide-eyed corpse in a closet. The unseen Hamilton Burger orders an arrest. During it all, Perry has a miserable cold and would rather be in bed. Della comes to the rescue. She nurses the pajama-clad lawyer in front of his fireplace, and we get to see his apartment for the first time. 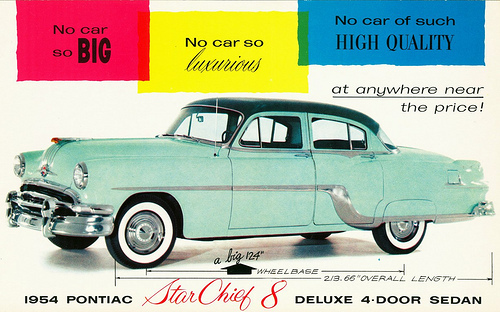 CARS: 1957 Cadillac convertible, black w/ black & white int., top down (Mason); 1957 Pontiac Star Chief Convertible, top down, medium color; 1954 Pontiac Star Chief 4-Door Sedan, light color, photo&brochure; 1957 Chevrolet 150 4dr sedan, black (Police). From The Cars by Greg Cockerill. Continuity Error: Watch the night cleaning man that Della convinces to let her into the Tydings & Dawson office. As he graciously opens the door for her, he magically acquires a pair of black rimmed glasses as the camera angle changes to inside the office. See here. Submitted by �BB,� 2/4/2004. Shortly after Abigail E. Leeds leaves Perry�s office for the first time, Della takes a call from Paul and relays the message to Perry. He says �Call Paul back. Tell him I�ll meet him downstairs.� Della replies �Oh, that�s where he is. Down at Clay�s Grill.� I think that this is the first mention of "Clay�s Grill" in the series and that we don�t encounter Clay or his Grill again until the last season. Submitted by Mitch English, 6/28/2005. + Actually Clay�s Grill figures prominantly in ep. 8: The Case of the Crimson Kiss. Perry is eating there when he receives the call that involves him in the case. Later he has a meeting with Burger and Tragg there, and later still Perry meets Della and Paul there. Submitted by R Dean, 5/12/2008. Phone numbers: Perry�s office number, MA 5-1190, makes its first appearance as the number for the Tydings and Dawson office. Paul gives it to the operator when he makes his warning call to Perry from the phone booth. Submitted by D. A. Supernaw, 12/13/2006. +Correction: Further examination indicates that the number in this episode is MA 5-1199, very similar to Mason�s number, but one digit off. Submitted by alan_sings 10/01/2010. + See more discussion of this among the next episode trivia. Submitted by gracep, 11/21/2010. Anomaly: Near the beginning of this episode, when Leeds first visits Perry�s office, she introduces herself as �Leeds, Abigail Esther.� Near the end of this episode, when we see the birth certificate for Leed�s daughter Carol, her name is listed as Abagail Edith Leeds. (Of course, either name fits with the ending credit of Abigail E. Leeds.) Submitted by Charles Richmond, 10/9/2008. + Paul also calls her "Abigail Esther" when telling Perry the information about her passport he got from Washington. Kilo 12/4/2018. + ...Because, as Ellis tells Mason (at 43:10 of the 2006 Paramount DVD), "It's all there. Photostats and originals." lowercase masonite, 2/9/16. One of the few Perry episodes where there is no trial, no courtroom, no judge, and no Hamilton Burger. The guilty party is determined before a trial can take place. Submitted by PaulDrake33, 25 August 2009. Lt. Tragg crosses paths with Perry four different times at four different locations (outside of Perry�s office) during this episode, surely a record! Submitted by PaulDrake 33, 25 August 2009. Uncredited Actors:Lee Miller walks on the opening scene with distinguished Lady # 2. Submitted by BigBill767, Nov 12,2016. Sighting: Distinguished Lady #2 gets a lot of exercise in this episode. In the opening scene, she walks by the Greybar Building. Later on, while Paul and Perry talk outside Clay�s Grill she passes behind them on the footpath no less than 3 times! Then, once again she is outside the Greybar Building, right behind Ellis. Phew! Submitted by evelyne, 15 February 2011. Character Names: The Officer in the credits is named Bill Duggan. He even spells it for us. Submitted by gracenote, 8/28/2011. Sightings: Distinguished Gentleman #2 plays some kind of attendant or guard at the office building where Tydings & Dawson is located. Submitted by gracenote, 8/28/2011. Goof: As Perry enters his office through the private door, someone else�s hand reaching for the knob is visible. Submitted by gracenote, 8/28/2011. Some pictures here. Goof: After Perry and Paul discover the body, Mason says "That's not the same man that came to see me at the office." But Dawson met Perry at his apartment not his office. (In the novel they met at his office. An earlier version of the script may have had them meet at the office as well, and this line wasn't changed when the scene changed.) Submitted by Wiseguy70005, 5/19/13. + Good catch. The novel IMHO handles the meeting much better. Aside from the front door of Perry's apartment having neither peephole nor lock, why would a prominent attorney with enemies invite in to his apartment a total and suspicious stranger at 12:05 AM? 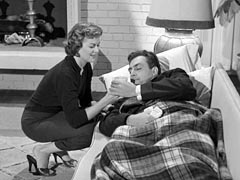 The scene begins (at about 07:19 on the 2006 Region 1 Paramount DVD) with Perry asleep in his chair, papers in his hand, next to an ashtray and cigarette lighter. At least the firefighters will not have to break down his door to get in. Submitted by (lowercase, with a comma and period) masonite, 07/17/13. Whose body? Now I'm confused. When the body falls out of the closet, Perry says "That's the same man who came to see me at the office." (My colleague above may have misheard that line.) But at any rate it's not Dawson but Albert Tydings, whom Perry never met, at his office or anywhere else. Submitted by francis, 5/29/14. + I think the problem is Raymond Burr's delivery of the line. Even though the line should have been "that's not the same man..." he says "'snot the same man..." which sounds more like "that's the same man..." In any case the closed-captioning reads "that's NOT the same man..." Submitted by Wiseguy70005, 5/30/14. Law Books: When we see Perry's apartment, there is a stack of law books near his clock and phone. It is from the same set (Corpus Juris) that is seen in the closing credits through "The Fan Dancer's Horse" (including this episode). In fact one of them is the same volume, number 51, "Public Utilities to Railroads." Also in Perry's apartment is Volume 34 ("Judg... to Judi...") (Judge Judy? LOL) and two unidentifiable books. Seen in the closing credits with Volume 51 is Volume 39 from Corpus Juris and Volume 21 from the Pacific Reporter series. The publisher's name is crudely and not entirely successfully covered up. Other first-season episodes display different series: "The Demure Defendant" through "The Deadly Double" show books from the American Law Reports-Annotated series (Volumes 5 and 6) along with the aforementioned Volume 21. "The Moth-Eaten Mink" and "The Haunted Husband" have smaller sponsor-size books later seen full sized in "The Haunted Husband" production notice ("The Moth-Eaten Mink" production notice has the old CJ books) and in the closing credits in episodes from "The Empty Tin" to the end of the season from the darker Corpus Juris Secundum set, Volumes 82 ("Statutes to Stipulations"), 97 ("Wills to Witnesses") and 98 ("Witnesses to Workmanship"). Do we see any other identifiable volumes from any of these sets in the actual episodes? Submitted by Wiseguy70005, 5/30/14. The original ESG novel gave the script writers some unusual names to play with: Byrl Gailord (who becomes Carol Stanley), Abigail Esther Tump (who becomes Abigail E. Leeds), and Arthmont A. Freel (who does not appear in the episode). Submitted by BobH, 26 May 2016. When Tragg arrives at the lake Perry and Paul get in their car to leave. Perry has to back out. However, just as the scene fades to black you can see the car surge forward as if Perry has it in the wrong gear. Submitted by Kilo 3/4/2018. + I agree! It would be interesting but doing The Office took several years and nearly drove me crazy. I'm afraid, a similar analysis of Perry's apartment by me is not likely. Any volunteers? Submitted by daveb, 2/27/2011. The $80,000 that is missing from Carol Stanley�s trust would be worth about $589,249.02 today. A fairly tidy sum. Tydings took $60,000 ($441,936.77), Ellis $20,000 ($147,312.26). The $2000 retainer that Perry gets would be about $14,731.23 today. Not too bad. The $150 that Leeds was paying to Ellis would ring in at about $1,104.84 a pop. billp 12/27/2008. Perry begins and ends this episode wearing a pair of pajamas. Submitted by PaulDrake 33, 25 August 2009. The aforementioned discovery of the corpse may certainly be one of the most dramatic moments in the history of the series. But the reaction that both Perry and Paul have to the body falling in front of them I found to be downright hilarious. Neither one of them bat an eyebrow, and they calmly walk over to the phone. Submitted by Kenmore, 1/18/2011. + I daresay if I came across as many dead bodies as Paul and Perry do, I'd probably not bat an eye either. Even so, I found the deadpan reaction - IMHO totally appropriate for the characters - hilarious, too. Submitted by billp, 2 August 2012. +Not only is their reaction hilarious, but one wonders how Tydings's corpse was so compliant in being placed in an upright position inside the closet and remaining in that position until the closet door is opened. Also, once the compliant corpse is placed upright, how does the person who placed the body in that position get out of the closet? Submitted by BobH, 21 December 2015. ++And, while the topic is the corpse's odd positioning, how about the difficult-to-achieve "face plant" position in which Tydings's body is first found by Carol Stanley? 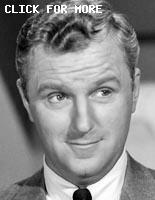 Actor George Neise wins the award, hands down, for Most Entertaining Performance by a Corpse in the show's nine-year run. Submitted by BobH, 23 December 2015. + Strange that both Perry and Paul handle the telephone thereby destroying any fingerprints knowing a murder has been committed. Submitted by Kilo 3/4/2018. It�s odd that Paul Drake�s thorough investigation of Robert Dawson concludes that the man is fanatically ("depressingly" --- jfh 18May2018) honest, while Tydings has a sheaf of papers that prove Dawson is guilty of misdeeds as incriminating as Tydings� own theft of $60,000 from Carol Stanley. Submitted by FredK, 9 June 2011. + The file that Tydings confronted Dawson with was Ellis' file on Carol Stanley, which Tydings had appropriated from Ellis. Since Dawson was in love with Stanley and didn't want to open her to public ridicule, he was effectively checkmated by Tydings and could not tell the authorities about Tydings malfeasance. So Paul Drake's assessment about Dawson was correct. Submitted by billp, 9/29/2011. How rude! Mason barely, if at all, acknowledges that Jerry brought him his car. He could have said "Thanks." Submitted by Wiseguy70005, 5/19/13. + goof: Perry picks up the handset and says, 'Yes' before pressing the button for line 2. jfh 09May2018. +What I learned from this episode: If you're blackmailing someone, don't let them pay you by check. If you're being blackmailed, don't pay by check. Since neither party wants the blackmail scheme exposed, stick with the anonymity of cash. Submitted by Duffy, 4-14-2015. Continuity: When Paul watches Ellis leave the Greybar Building a lady follows him out holding her hat and carrying a white purse. Paul then crosses the road to tell Perry that Ellis just left the building. In the background you can see the same woman again leave the building holding her hat. Kilo 12/4/2018. +I expect that Perry and his client will win, by his talents resulting in a good plea-bargain or a reduced charge. lowercase masonite, 2/9/16.